If you are looking for a cheap water bottle, buy one of the low-grade plastic models that are available online. 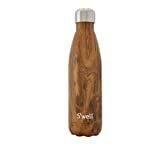 However, to get a valuable water bottle that never disappoints, S’well S’ip works the best. Made of stainless steel, you get a durable water bottle that does not dent easily. The material is also BPA-free and has a double insulated design that keeps water chilled for 24 hours. Even during warm sunny days, you will have up to 15-ounces of cool and refreshing water at your disposal. You can also use it to carry carbonated drinks without compromising their value or its performance over time. Athletes and campers need ready access to clean water to perform well outdoors. 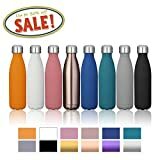 If you are a part of this group and have a difficult time finding the best water bottle, consider this Hydro Flask. Popular worldwide, it is a durable double-walled water bottle made of stainless steel. It is 100% leak proof. If you camp often and like to carry water along, it will not damage your belongings, as other models do. It also has a wide 1.81-inch opening for easier loading and washing. Finally, you get an advanced vacuum insulation technology that keeps water cool longer. If you hate the yucky taste of warm drinking water, this is the product for you. Whilst exploring the outdoors, the quality of the water bottle that you use matters. This glacier cyan-themed model from RevoMax, for instance, is a popular Twist Free model made of stainless steel. Liked for its toughness, it lasts longer than the traditional plastic bottles that people have used for decades. It also safe and has a vacuum insulated design that works well outdoors. Together with its energy-reflecting inner layer, for instance, it keeps water cold for up to 36 hours. Hot beverages, on the other hand, stay hot for up to 18 hours. You will also like its tight-sealing treadles cap and stylish exterior (powder coated matte finish). Available as a set of two, Modern Innovations works best for campers and athletes. Because you get two bottles, for instance, you can carry water and a beverage of your choice (hot or cold). Each bottle is also spacious (17-ounces) and made of a leak-proof stainless steel that withstands abuse well. If you travel often, you do not have to worry about these bottles breaking or bending out of shape over time. Finally, both bottles have an effective vacuum insulation. They also have wide mouthed designs for easier filling and cleaning. Water bottles are simple accessories that work the same. If you have this thought, think again. Premium models such as S’well are not only aesthetic (Teakwood) but also have functional designs that people like more. With one, for instance, you get a spacious accessory that accommodates up to 17 ounces of water. This makes it an ideal item for traveling, camping, and outdoor use in general. It also has a durable double wall design with an interior copper layer that improves its efficiency. Cold beverages stay cold for 24 hours. It also keeps hot beverages hot for 12 hours. 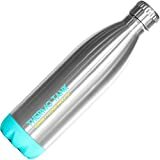 This water bottle is affordable and made of a food-grade 18/8 stainless steel. In the water bottles niche, S’well takes top honors in terms of value for money. 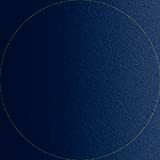 This ocean blue model, for instance, is a stylish 17-ounce accessory that performs as well. Its vacuum insulated double-walled design keeps beverages hot for 12 hours and cold for 24 hours. The food-grade stainless steel (18/8) used to make it, on the other hand, is durable. It also has a copper lining that keeps beverages fresh over time. If you are shopping for a water bottle for traveling, do not hesitate to buy one. It fits comfortably in the hand. It also has a spill-proof design that fits in bike cages and the cup holders in cars. In the past, stainless steel water bottles were expensive accessories that only celebrities used. If you are still using your smelly plastic bottle because of your low budget, read on. Popular worldwide, KINGSO is an affordable stainless steel water bottle with a spacious 17-ounce design. Colors are diverse and eye-catching. Its dent, leak, and sweat proof design, on the other hand, is one of the best for traveling. You can use it when cycling, for instance. Hikers, campers, and athletes also appreciate its value. Finally, KINGSO is 100% food safe. Forget about BPA and other harsh chemicals polluting your water. Its double-walled design also features an advanced vacuum insulation technology that keeps water chilled for up to 9 hours. To get a quality bottle for carrying water to school or work, Simple Modern Wave is ideal. Made of stainless steel (food grade), it is a durable accessory. It is also lightweight, sweat-free, and has a tight-sealing twist-on lid that contains spill well. You can even store it in your backpack without worrying about damaging your books or documents. Whilst in use, cold drinks stay cold for 24 hours. Hot beverages, on the other hand, stay hot for eight hours. Buy a color and size of your choice to have a good time outdoors. Even though pricier than some water bottles that we have reviews, you get an impressive 25-ounce accessory. Size is not its only strength though. The food-grade stainless steel used to make it is durable. The copper technology that it uses keeps water and beverages fresh. Finally, its superior vacuum insulation technology appeals to frequent travelers. Water with ice, for instance, stays cold for a whopping 36 hours. Try one risk-free. In their haste, many people buy low-quality water bottles that compromise their health. Do not make the same mistake. MIRA is an affordable vacuum insulated model that will serve you better. Perfect for sports use, it has a rugged body (18/8 stainless steel) that does not dent nor break easily. Sizing is appropriate (25-ounces). Finally, its superior vacuum insulation and convenient Easy Flow mouth have earned it the first spot on our review.